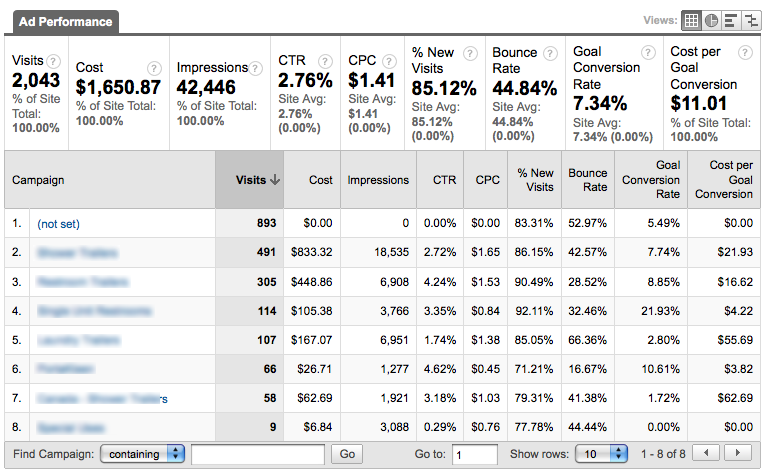 Here’s an example of a custom report I’ve found very useful for looking at AdWords performance. You can get all the same data in the AdWords reports in the Traffic Sources section of GA, but it’s separated in tabs so you can’t see it all side by side. There are a few things I want to know about an ad, from start to finish when someone interacts with it: how many people saw it (impressions), how many of them clicked through (CTR), how many of them have never been to the site before (% new visits), how many of them stuck with the site past the landing page (bounce rate), and how many of them actually achieved the site’s goals (conversion rate). And to make comparisons overall among ads, I want to know how much I spent (Cost and CPC), and especially how much I spent per goal conversion (that’s basically my cost of acquiring a customer). And here’s how it’s set up in the Custom Reporting interface. Since custom reports don’t allow you to filter out just the data that you want, you’ll notice that all the visits to the site are here, not just AdWords. So you’ll see there’s a campaign “(not set)” that’s all the non-campaign traffic, and you’ll see any other kinds of campaigns you have running listed here as well (such as email campaigns). 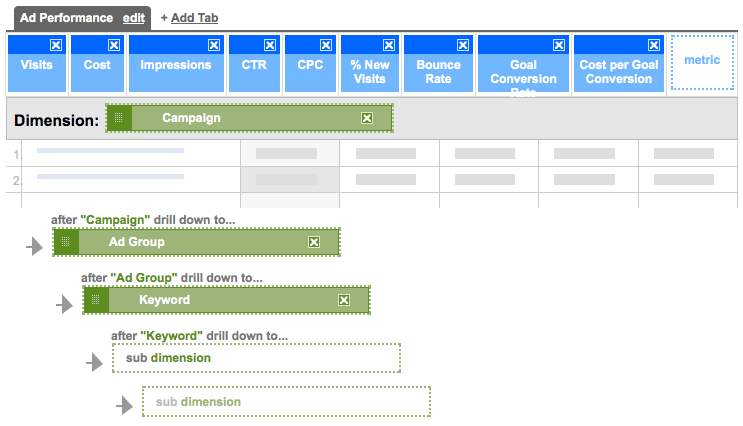 However, only AdWords campaigns will have the cost data we’re really interested in for this report. So you may want to either add “Source / Medium” as the very first dimension (so that you can click through on “google / cpc”), or use this report on a profile that has a filter to include just your AdWords traffic, or an Advanced Segment for just your AdWords traffic.